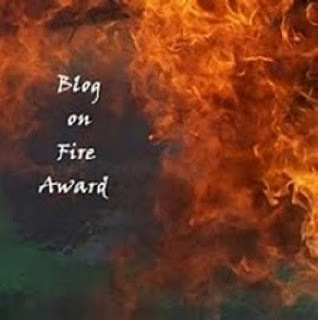 I’m so honored that One Picture A Million Words nominated my blog for the Blog on Fire Award! Thank you so much! A funny story, at least funny to me, but I thought this was spam when I first received notification! I hadn’t heard of the award…there are so many blog awards out there…and I just immediately assumed it was some spam and didn’t pay much attention to it. I get some pretty crazy spam comments so I’ve started assuming something is spam first! Terrible, huh? So imagine my surprise when I saw it was real! I actually don’t read other blogs very often. It’s not that I don’t like to read them but quite the opposite actually. I can spend hours looking at other blogs. And then I start doubting my own blog and think about all the changes I want to make but am not sure where to start. I know nothing about html coding, for starters, my photography needs so much work, and I need to start developing more of my own recipes. I start thinking mine doesn’t even deserve to be up there when there are so many other great blogs out there. And is anyone even reading my blog? Why would they read it if they have so many other choices! I’m sure many bloggers feel that way. It’s a tough, yet awesome, bloggerverse out there! And I’m proud to be part of it! Thanks to all my followers for reading and supporting me! You Rock! The rules for accepting are to list 8 things about me and nominate 8 blogs. 1. I met my husband when we were both in the military. 2. In a former life I was a meteorologist. 3. I have a Master’s degree in Human Resources Management that I’ve never used. 4. I used to own a pet sitting business. 5. I have two little doggies whom I love dearly and make me smile every day. 6. My husband is my best friend. I’m thankful every day that we found each other. 7. I’m from North Dakota but never want to go back. 8. I want to move to the Pacific Northwest.